I feel sorry for anybody who isn't using this cleanser - there isn't a skin type out there that doesn't need this! I have true combination, acne prone, sensitive/reactive skin & I've learned the hard way that ph is EVERYTHING. Got a skin issue? Get your ph under control! If your skin is feeling tight after cleansing, - no, it isn't a good thing, stop punishing yourself!.. This is the only cleanser that truely leaves my skin feeling clean, soft & moisturized from within. I'd go as far as saying this is truly the first step in my skincare routine, as an actual treatment, because of how pampered my skin feels after this cleanse. Recommended to others, male & female, & they were in disbelief to learn this cleansers don't have to leave their skin feeling tight/dry/sensitive. This is a great cleanser! It's really gentle and I find it removes my makeup quite well. I usually have to go in with another makeup remover to fully remove my mascara but overall it's great! It doesn't break me out even though I have quite acne prone skin and unlike other cleansers it doesn't leave my skin feeling dry. Would recommend this product! Lella - Love it! Best cleanser! This is perfect for my combination skin. I was using the resist cleanser for combination/oily but found that products like the toner and serum that I applied afterwards stung for a few minutes. Since changing to this cleanser my other products don't sting at all. My face feels really clean but not stripped and my slightly oily t-zone hasn't broken out. I'll definitely be repurchasing. Amanda - Go big...in cleanser size anyways! This cleanser is amazing, it really does brighten the skin with regular use, it easily removes a full face of makeup so I no longer use a separate makeup remover and you need so little per cleanse that it will last ages. If you think that all cleansers are equal then you ain't tried this one! Okay, wanna change your face? No? Me either but I DO want clean and soft skin and, oh my, do you get it with this! If I could only have one PC product, this would be it. I bought the trial size end of May and end of June I finally run out and order the full size. I admit my initial expectations of all PC products was, well, ridiculously ambitious so once I got real and a month on, I just ordered a whole bunch of stuff, some new some old and NEVER again will I use anything other than PC. After about 3 weeks of using PC products I DID have smaller pores on some areas of my face (large pores caused by hereditary we're stuck with but those that are clogged can shrink once they are cleaned out) and my make up goes on like a dream! My husband was mighty impressed, his wallet...well we won't go there! I have tried so many "complete" make up removers & this is the only one that is incredibly gentle yet effective on my sensitive combination skin. It's superb cleansing power removes all of my heavy makeup without leaving my skin taught/dry/oily. I do not normally write reviews but due to how happy I am with this product I felt it necessary. 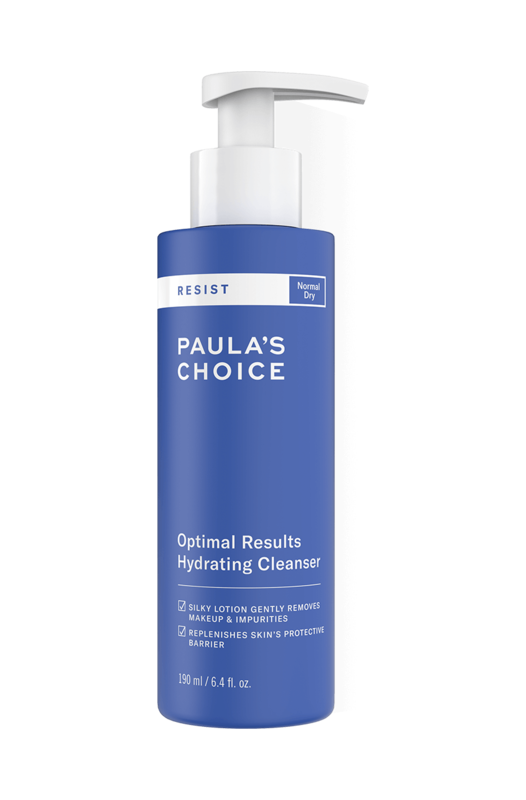 I have never used the Paula’s Choice in the past, but what brought me to this product was research into hyper-pigmentation (sun damage/brown spots) on the face. Having naturally olive skin, I always tanned very easily, but years of SPF neglect has resulted in extremely dark pigmentation appearing right across my cheek bones. After going on holidays (and since turning 30! ), it would take ‘months’ for this to tone down back to an even skin tone, and other facial products seemed to have no impact at all. However, after a few weeks of using the RESIST Optimal Results Hydrating Cleanser, the brown spots began to clear, and now I am very pleased to say my face has a lovely even toned complexion, and I am back to being foundation free. I have also received lovely comments that my skin is ‘glowing’. I have since purchased other products from this range and I will continue to do so. I am aware this this product may not be suitable for all skin types, but it is perfect for me. I bought this cleanser along with the other products from the RESIST line (bar the AHA exfoliants) as I'd been dying to try them. This cleanser is recommended for all skin types but I would say it suits drier skins better: it's a thick cream cleanser. I was worried but it as I used it, it seemed to do the job. My face didn't feel overly cleansed. In fact, it relieved some of the tightness from the Skin Balancing Cleanser, but the oil did eventually start to return so I went back to the Skin Balancing Cleanser. I found myself using two pumps of product every time I cleansed so I didn't think it would last very long. I estimated a month and a half at best and I was right. Another thing that stood out for me was the amount of product you receive. 190ML of product yet you're charged an extra £1.95. All the RESIST products seem to follow this rule: less for more which is strange as one of Paula's main gripes with the cosmetics industry is that practically every other cosmetics company reduces the amount of product you get and doubles the price when it comes to anti-ageing. As a plus, I do love the pump dispenser though I can't help but wonder whether fancy packaging for the RESIST line reduces product and bumps up the price. In conclusion, a good cleanser for dry, not blemish-prone, sensitive skins. Best of both worlds with this cleanser, the benefit of not stripping the skin that a cream cleanser has but also actually clearing the skin of excess oil/makeup that a lathering cleanser does best. No tightness, redness, irration after use or rushing to moisturise afterwards. Unfortunately I'm not sure why when Paula in her books laments overly expensive skin care and especially cleansers (they're on the face for such a short time and washed off) that this is quite expensive at only 190ml. I bought a sample and it came today. I used it and loved it but unfortunately, it's just too expensive to use all the time. I wash my face once in the morning and twice at night. Once to get the makeup off and the second to clean my skin. I think £17.75 is quite expensive for 200ml of cleanser.